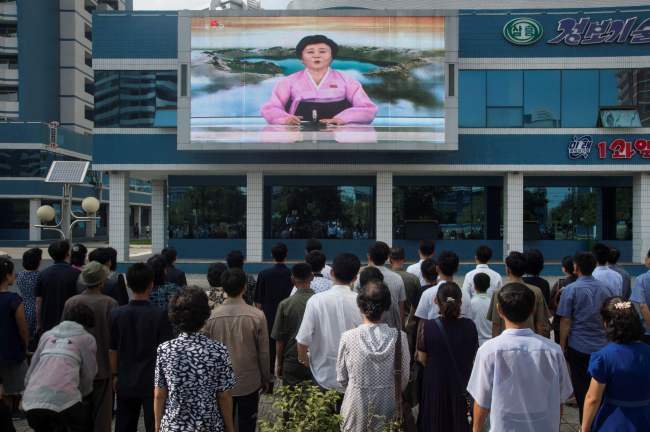 With Sunday’s nuclear test, North Korea is seen drawing increasingly closer to becoming a full-fledged nuclear weapons state, which would further unsettle Northeast Asia’s geopolitical landscape and may escalate risks of a military standoff. State media said the test was designed to chiefly examine the technology to adjust the explosive power of a hydrogen bomb to be mounted on an intercontinental ballistic missile. As a result, it proved the high reliability of the device’s mutually reinforcing fission-fusion reactions. In a separate dispatch hours earlier, the official Korean Central News Agency said the bomb is a “multi-functional thermonuclear weapon with great destructive power which can be detonated even at high altitudes for super-powerful electromagnetic pulse attack.” The North’s leader Kim Jong-un took a look himself at the device, whose explosive power is adjustable from tens to hundreds of kilotons and whose components are all “homemade” and can accordingly be mass-produced, it said. The latest underground detonation was the North’s sixth, since its maiden round in 2006, and potentially its last one, experts say, noting a country would typically conduct five or six tests before mastering the bombs. India and Pakistan were believed to have each tested their devices five and six times until 1998. In the fourth test in January last year, Pyongyang claimed for the first time to have employed a hydrogen bomb. But South Korea’s military and intelligence agency assessed it was likely to be only a boosted fission weapon, citing the event’s relatively weak 4.8 magnitude tremor and 6-kiloton yield. While initial assessments vary, the 6.3 magnitude sixth test may have yielded up to 100 kilotons -- the biggest ever so far and five times that of the US’ Fat Man dropped on Nagasaki in 1945 -- according to Rep. Kim Young-woo of the Bareun Party, who chairs the parliamentary defense committee. Seoul’s military put its preliminary estimates at 5.7 magnitude and about 50 kilotons. The explosion also came about one month after Pyongyang successfully fired an ICBM for a second time, which it claimed was capable of reaching the continental US. Taken together, the Kim Jong-un regime appears to have managed to swiftly advance its nuclear and missile capabilities -- possibly to the point that it does not need any more major launches and underground explosions, observers say. “Now we have to think that the rules of the game have completely changed in the security issues of the Korean Peninsula,” lawmaker Kim said at a news conference. Kim Dong-yub, a professor at Kyungnam University’s Institute of Far Eastern Studies in Seoul, said the KCNA report’s reference to the fission elements and ongoing development process suggested the latest test once again involved a boosted fission weapon. 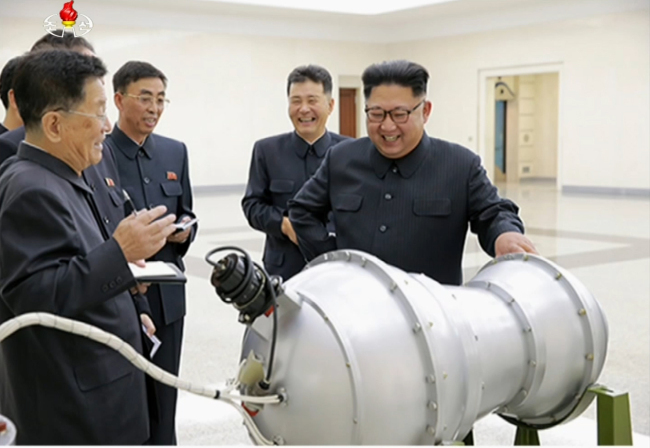 But he noted KCNA images indicated otherwise as they showed Kim Jong-un inspecting a silver-colored, peanut-shaped warhead mockup akin to the appearance of a two-stage thermonuclear bomb, unlike a ball-shaped device unveiled previously. “The experiment appears to target South Korea and the US which view that the North does not have an ICBM warhead with decent explosive power given their doubts over its warhead lightening and miniaturizing technology,” the professor said. 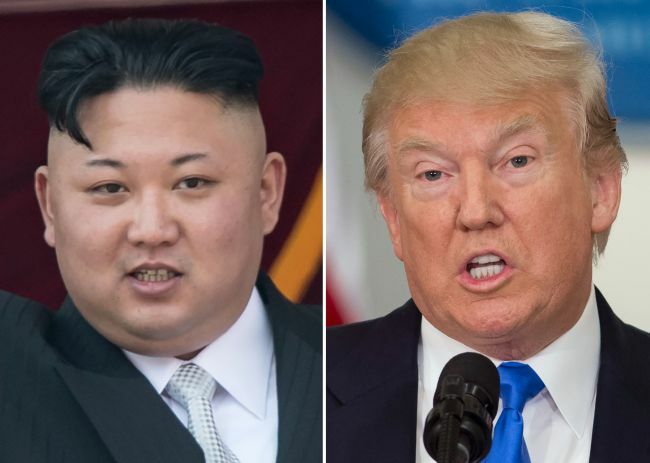 The Donald Trump administration, for its part, is expected to harden its line against the regime, faced with rising threats that it is nearly capable of striking the US mainland with a nuclear-tipped missile. Japan, which has been voicing its opposition against talks with the North, especially after it launched a missile over the archipelago last week, also delivered a stern rebuke after the latest provocation, calling it “unacceptable” and vowing stringent countermeasures. Skepticism may also well resurface over the efficacy of sanctions as all the weapons experiments have taken place in defiance of a series of UN Security Council resolutions and independent punitive measures by Seoul, Washington, Tokyo and other countries. Debate has been rising for the need to prepare military action on the communist state’s nuclear and missile facilities, especially following the two ICBM liftoffs. Some former administration officials and experts around Washington have floated the idea of a pre-emptive attack on the condition that the US and South Korea detect clear signs of the North’s immediate missile launch. In 2015, the allies completed the drawing of a new operational plan, OPCON 5015, which calls for a pre-emptive strike on the North’s nuclear and missile facilities as well as “decapitation” raids targeting its leadership. Their militaries have since been applying the scenario to their joint exercises. President Moon Jae-in (far left) speaks at a National Security Council meeting at Cheong Wa Dae on Sunday. Any potential US move for military action, however, would prompt backlash from the Moon Jae-in government, which has been saying “no more war” on the peninsula and calling for dialogue as a foremost solution to the crisis. The military option has its own constraints, too, such as possible flaws in intelligence and risks of miscalculations which may intensify into an all-out war. Professor Kim also said now is “not the time” to continue the appeal for denuclearization or a freeze-for-incentive deal to an aloof Pyongyang. “The government will need to work more with the international community to have China stop crude supplies and oil exports to the North, while exploring in earnest steps to clear Beijing’s concerns over the deployment of the US’ Terminal High Altitude Area Defense anti-missile system here,” said Cheong Seong-chang, head of unification strategy at the Sejong Institute.